There’s something happens when people get together in groups. Their IQs halve. If the most obvious fact an outsider puts to the group is incomprehensible to them, the interloper should be set upon and duly removed by the group’s designated attack dogs. Take for instance what happened during the onset of this economic depression. Economists obviously aren’t to blame. How could they be? Nobody could have possibly foreseen this financial collapse approaching. (A veritable cyclone, the Prime Minister calls it.) Those one or two blowhards, such as Steve Keen, who claims to have foreseen these debt levels to be ‘impossible’ are simply publicity-seekers. Did they actually want to destroy confidence in the economy? They ought to know that mountains of debt are a house of cards, waiting to fall if they utter the wrong words! Why didn’t these individuals accept their responsibility to see the economy as ‘a matter of confidence’? Access Economics has played a much more respectable part throughout. Chris Richardson patiently and simply explains what has already happened to the economy. There’s no harm in that, so long as it’s well and truly after the event. That’s the way it should be if we are to retain peoples’ confidence in the financial system. Albeit we may allow economists to take a guess at next year’s increase in GDP, and the overnight cash rate that might apply at this time next year, that’s just a nice game. You may conclude with absolute certainty that anyone who claims to see where we’re really headed, especially if they see dark clouds looming on the economic horizon, is most certainly an imposter, a fraudster, not at all worthy of the profession. And take the example of the political parties. They may seem to be at odds as they cut each other to shreds, but they still honour the group rules. Neither major party may support any action of genuine reform, because that simply gives the other side too much leverage for criticism, and that only ‘scares the horses’. It’s common, in fact, to accuse the other side of scaring people. And some people are clearly too simple to have truth thrust upon them. So, the status must remain pretty well quo. That’s really what confidence is all about, isn’t it, being concerned to leave things more or less as they are, whilst giving the appearance that things are going along smoothly with all the legislation and stuff? Just as GW’s Republicans, who governed during the build-up of the US residential bubble and oversaw CDOs and CDSs sweeping voraciously across the financial landscape, are suddenly able to see exactly where Barack Obama is making his terrible mistakes, so Malcolm Turnbull has also been endowed with a gift of economic insight apparently unavailable to Peter Costello when he presided over developing Australia’s greatest ever real estate bubble. And what sort of an idiot believes that turning a depression around is easy? And, as we said, politicians can’t get involved in providing real solutions. Rather, it’s their job to look concerned and extremely busy as they go about seeking ‘global solutions’. 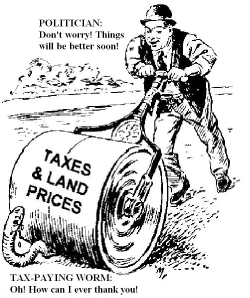 Some stupid clowns even say you can fix it locally, by reversing the process that delivered the depression in the first place, by replacing taxes on people for working with charges on land for speculating. (One can only hope Ken Henry consigns that one to the WPB!) That, they claim, would give just about everyone a permanent wage increase and get the economy moving again. It’s no good bailing out businesses, they say, if people haven’t a dollar to spend on those businesses. And, we should simply allow the un-repayable debt to be written off inside what they claim has been a profligate financial sector! Profligate?! Then, as we prepare to bail the banks out, they impudently confront us with: “Why should we bail banks out, instead of focusing on re-creating effective demand within the community?” Purveyors of this sort of nonsense used to be tarred and feathered and sent out of town! Although we’ve got to support failed major institutions, this can’t be extended to small business, of course. And don’t fall for the one about people being the real economy! Crackpot ‘seers’ have gone about as far as they should be allowed to go. It’s quite obvious that manufacturing and real wealth creation has long ago been driven offshore to where the tax breaks are, so who wants to cut taxes and capture land rents now? It’s all too late; the horse has bolted! The whole system has come to revolve about penalising capital and work, and rewarding property rorters, so it’s only an idiot, someone outside the anointed in-groups, who would want to interfere with the set-up! Our societal groups are all now committed to this form of capitalism. It’s what we know and understand. Anyway, this is a major recession, and it’s about this time we usually wind rates and land taxes back, not increase them! So, who are we going to call in to fix this depression? Why, economists, of course! They’re the experts! They, and their economic models. * Bryan Kavanagh forecast the current downturn in “The Coming Kondratieff Crash: Rent-seeking, income distribution & the business cycle” in the UK Centre for Land Policy Study journal “Geophilos”, Autumn 2001 No.01(2). He warned in THE AGE (June 15 2005) against the RBA increasing interest rates because the outlook was seriously deflationary, not inflationary. Over the next three years, the RBA subsequently increased interest rates seven times, before dropping them 4% in a matter of months. In 2007, his report “Unlocking the Riches of Oz: a case study of the social and economic costs of real estate bubbles (1972 to 2006)”defined and quantified the extent of the current real estate bubble and demonstrated that bubble-induced recessions, together with other deadweight costs of taxation, cost Australia some $1 trillion each year.